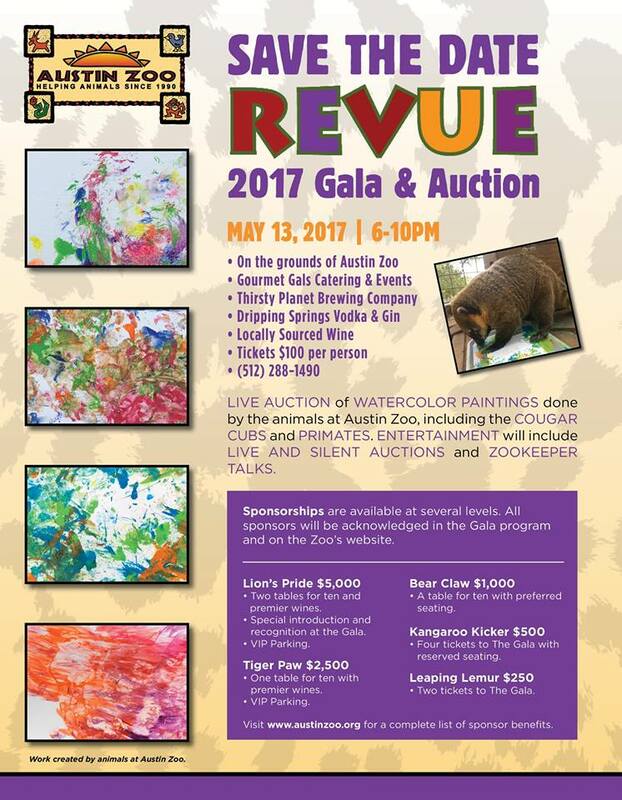 You are invited to attend a very special and unique event – the fourth annual Austin Zoo Revue and Grand Gala on the evening of Saturday, May 13, 2017. Join us in raising funds that will directly benefit the more than 300 deserving animals who live and thrive at Austin Zoo. 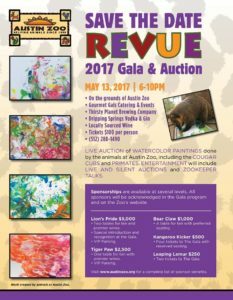 The Gala will feature a spirited live auction in which large watercolor canvas paintings created by Austin Zoo’s primates, cougars, coatis and various other animals will be sold to the highest bidder(s), along with additional exceptional items. The evening will also include personal Zookeeper talks on Austin Zoo’s animal residents, an extravagant buffet by Gourmet Gals Catering & Events, locally crafted beers by Thirsty Planet Brewing Company, a specialty cocktail by Dripping Springs Vodka, locally sourced wine and a silent auction with over 100 items. Individual Austin Zoo Revue and Grand Gala tickets may be purchased for $100. If you would like to become a sponsor over the phone or if you have any additional questions, please call Austin Zoo’s Gift Shop at 512-288-1490.